Really. And it’s already February 2019, even though January 2019 felt like it was 2 months long. I did a new-poem-a-day grind in January, which is maybe part of what made it feel extra sloggy. Also plenty of snow-shoveling. I’m just here to say “hi” by way of some updates! This week, my villanelle, “Aquarium,” from my very first chapbook, A Thirst That’s Partly Mine (Slapering Hol, 2008), is featured in Ted Kooser’s “American Life in Poetry” column. Last month, my poem, “Putting the Flowers Out,” was published in Atticus Review. It includes the phrase, “piss-ridden,” which I think is a poetry first for me! I’ve got a couple of readings coming up later this spring, and am anticipating the publication of a new chapbook, called Song and Scar, from No Chair Press. Stay tuned for more info on that as I get it! haven’t bent or softened at the corners. ask shouldn’t I go outside and get some fresh air? or the whispers of turning pages. beneath my feet as I sprinted across it. lost one of his many in pages like these. in this pause before plowing forward again. In December of 1968, a particularly difficult year in the U.S. and elsewhere, NASA’s Apollo 8 mission offered a moment of hope and beauty. Launched on December 21, the mission achieved many important “firsts” critical to achieving the moon landing, which would eventually happen halfway through 1969 — first (manned) launch from the Kennedy Space Center, first crewed flight of the behemoth Saturn V rocket, first humans past high Earth orbit, first humans to the moon, around the moon, back from the moon, first live TV images of the lunar surface. But it was one of the first still color photographs taken by a human (Bill Anders) from deep space that became a provocative and enduring symbol of the beauty and fragility of our blue planet. 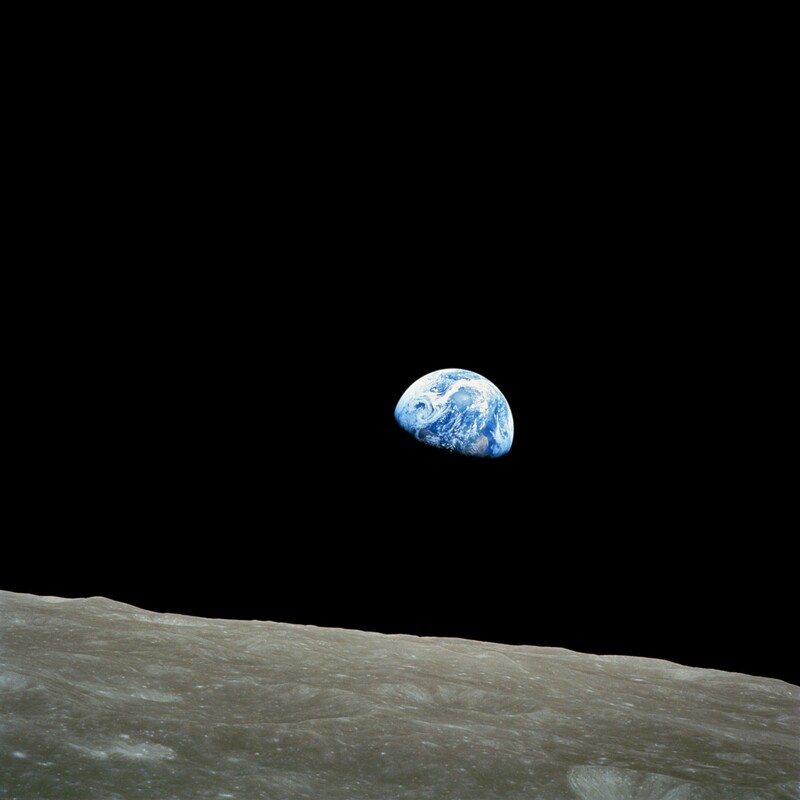 It came to be known as “Earthrise,” and it was taken on December 24, 1968.
with the laser-vision of all those eyes. to set down on paper. with which they were programmed. from beneath the moon’s horizon. Did Rose survive The Holocaust? Haunted by loved ones that she lost? that version of her falls apart. can light what darkness tries to drown. What is the truth? What is the lie? How will grief and beauty travel? How will what’s good start to unravel? and then, in violence was lost. Did she survive the holocaust? She did not. She did not. Here’s a poem Barrelhouse chose for their Anthony Bourdain tribute series, which has been quite a read. Hope you’ll spend some time reading through them all — a great diversity of responses. Come see me in NYC on May 24!